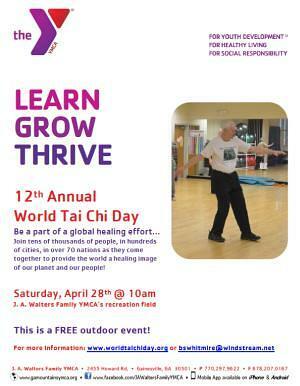 The 12th Annual Tai Chi Day comes to Gainesville as part of a global healing effort. You can join tens of thousands of people, in hundreds of cities, in over 70 nations as they come together to provide the world a healing image of our planet and our people. The free, outdoor local event takes place on Saturday, April 28 at 10 a.m. on the J. A. Walters Family YMCA recreation field. For more information, go to www.worldtaichiday.org or send email to ten.maertsdniw@erimtihwsb. Click the image at right to see the flyer.